Pair up and race water bikes or kayaks across the shoreline. First ones to the finish choose the next activity. If the high-speed slides at the main water park are a little too intimidating, keep it low-key (but equally splashy) at the water-play fort. You've got 19 to choose from. Go scene-y, clubby, cozy or sporty. Pool-hop your way around all 11, and save the best for last. The Aquaventure water park awaits. The Bahamas has been voted "Best Place to Snorkel with Big Animals" ten years running. Water adventures abound. Spacious studios, suites and penthouses make the perfect place to rest up for the next day's jam-packed itinerary. You're located right on the beach. Your kids will love the children's pool with waterslide, playground, and children's club. Paradise Island Golf Course is just a 9 minute drive away. Aquaventure Waterpark is located onsite. Try your luck at the Caribbean's largest casino, located onsite! Visit Mandara Spa for a relaxing massage, manicure or facial. Iconic for its nonstop whirlwind of attractions catering to every age group (even tweens have their own dance club! ), The Reef Atlantis leaves you wishing for a much longer stay. Or a return visit – either would be just fine. Even with a brilliantly-planned week of dining, shopping, casino-ing and water-parking, you’ll barely scratch the surface. Make the most of your unlimited access to all 11 pools in the genius 141-acre waterscape, which includes Aquaventure – one of the world’s largest water parks. Race down the high-speed slides, get soaked on the mile-long river rapids ride, and do your best to keep your camera dry as you capture action shots of the kids climbing around the splash-filled water-play fort. Recharge with catnaps and snacks from the kitchen cabinets or popsicles from the fridge back at your luxury studio, suite or penthouse before conquering a few more attractions. Golfers will want to take on the stunning Tom Weiskopf designed 18-hole Ocean Club Course, while the indulgence-seekers in your crew may be more intrigued by the award-winning Mandara Spa, where ancient Balinese techniques meet traditional European treatments. 21 restaurants await, so assign everyone in your group a night or two to be the chooser, then vote on your favorites at the end of your trip. With 19 bars, the ambiance varies from candlelight to casino floor – but before you go looking for DJs, drop your teens off at a nightclub of their own (no adults allowed!). Don’t stay out too late, you’ll want to be up early for Dolphin Cay, one of the world’s largest marine habitats – or try snuba, a form of scuba diving that doesn’t require certification. Taking a break from the 20 million gallons of water? For kids, there’s a pottery studio, movie theater and even an underwater-themed video arcade. And for the over-18s, the lively world-famous Atlantis Casino sits atop the seven-acre lagoon, connecting the two towers and attracting the eternally optimistic at 750 slot machines and 75 gaming tables (complimentary lessons daily). Located just off the shore of Nassau. Paradise Island is known as the filming location of the 2006 film Casino Royale and as the home of Atlantis. 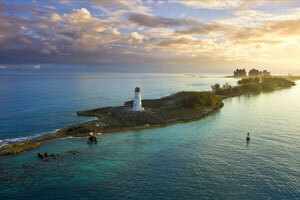 Experience Bahamian culture, fine dining, beautiful beaches and the exciting nightlife.